Even on a rainy Wednesday in January, the party goes on at Ole Red Nashville, especially when its favorite guy shows up for an impromptu pop-up performance. Blake Shelton took to Twitter on the afternoon of January 23 to tell his fans that he’d be performing at his own Broadway restaurant and bar that night. Within minutes, devoted BSers quickly lined up to receive wristbands for the free show. One pair of friends even rescheduled their evening flights home from Nashville just so they could be there to see him perform. 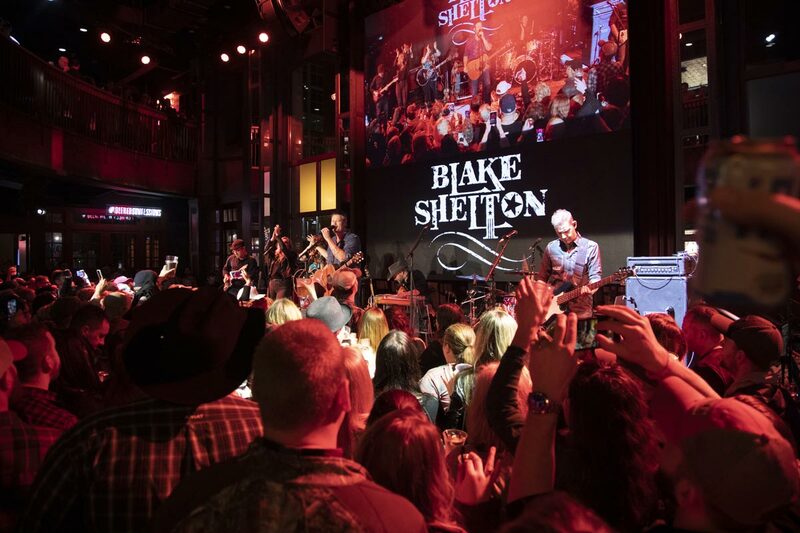 The house was packed as Blake sang and played for two and a half hours for the lucky crowd. Breakout hit “Ol’ Red,” which inspired the name for the venue, was on the set list along with more than two dozen other smash singles. Friends RaeLynn and Pryor Baird — both Team Blake contestants on The Voice — took to the stage, too. What a way to celebrate the kickoff of Blake’s “Friends and Heroes Tour,” set to begin on February 14 in Oklahoma City. You never know when Blake might turn up next. Be the first in the know by following us on Facebook, Twitter, and Instagram.